Cordia is a genus of shrubs and trees in the borage family Boraginaceae. About 300 species have been identified worldwide, mostly in warmer regions. Many Cordias have fragrant showy flowers and are popular in gardens, although they are not especially hardy. Like most other Boraginaceae, most have hairy leaves. Cordia species are used as food plants by the larvae of some Lepidoptera species including Endoclita malabaricus and two bucculatricid leaf-miners recorded solely from Cordia, Bucculatrix caribbea and Bucculatrix cordiaella. A number of the tropical species have edible fruits, called sebesten. In India, the fruits of local species are used as a vegetable, raw, cooked, or pickled, and are known by many names, including lasora in Hindi. 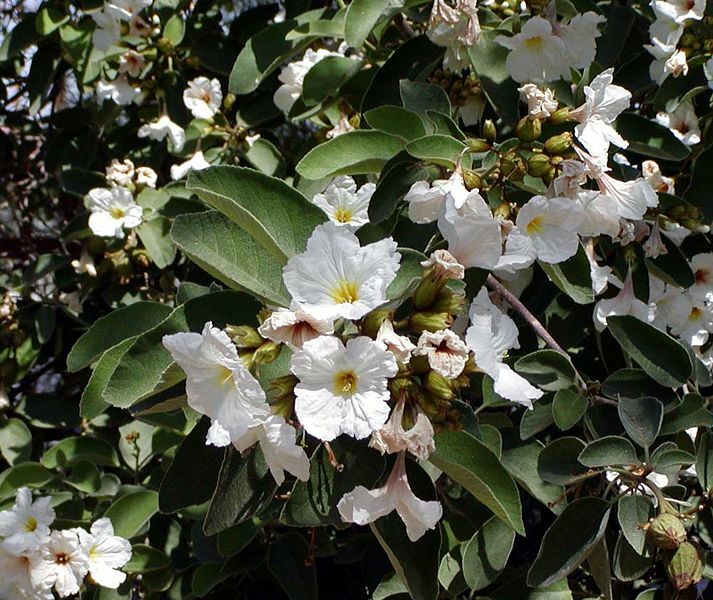 One such species is Cordia dichotoma, which is called gunda in Hindi. Tou Cordia subcordata (named Kou in Hawaiʻi).